Welcome and thank you for taking the time to visit my website. I am a local Newcastle Landscape Photographer with a portfolio of unique long exposure photographs from around my local area of Newcastle, Port Stephens & Central Coast Beaches. Newcastle and it’s surrounding areas being such a beautiful location with some amazing scenery and beaches. 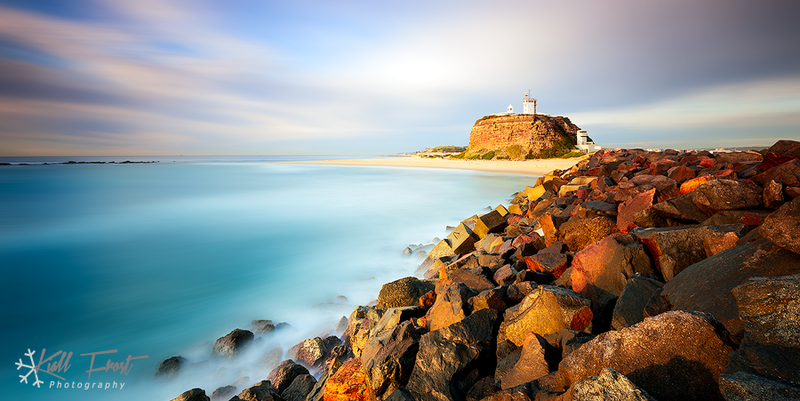 I have made a commitment to showcase Newcastle’s and its surrounding landscapes in all its glory. My goal is to create a unique collection of images from around my local area of Newcastle, Port Stephens and the Central Coast. Images worthy of hanging in your home, office or business. Whether your print is for work or home, a single framed print or a total office fit-out of multiple pieces, your new artworks will be professionally handled from start to finish using only the highest quality acid free products. Apollo Hotel in Charlestown display my landscape images in their hotel suites, hallways, conference rooms and restaurant. Large hotel fit-outs come with extremely competitive pricing and is an affordable way of completely changing the feel and vibe of your hotel. If you have any questions don’t hesitate to call and I will personally give you advice on the best size or print medium depending on the room and location in respect to the lighting which will ensure it looks its best and you are 100% satisfied. If you wish to license images I will provide high quality electronic image files as requested. The price for a prepared jpg or tiff image file for editorial or website use depends on your desired quality, size, resolution and use. © All images are protected by International Copyright Law and cannot be copied, downloaded, reproduced, transmitted or used in any way without written approval from Kiall Frost.